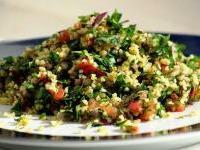 Soak bulgur in enough fresh water for about 15 minutes. Toss all ingredients in a large cooking bowl and add oil last. Serve the mouthwatering dish decorated with lettuce leaves.